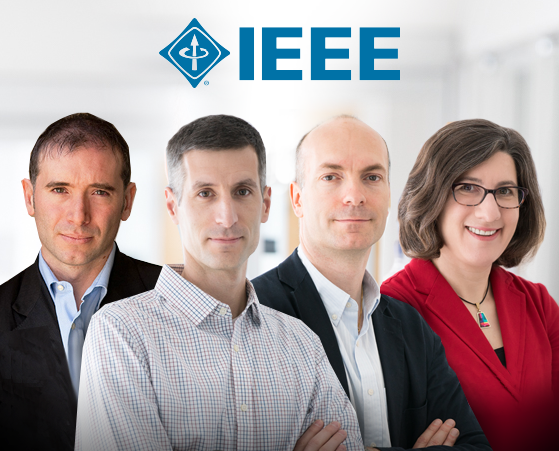 From left to right: Alessandro Acquisti, Lujo Bauer, Nicolas Christin, and Lorrie Cranor all received IEEE Awards earlier this month. Acquisti earned the IEEE Cybersecurity Award for Innovation for his groundbreaking work on the economics and behavioral economics of privacy and personal information security. His work has advanced the application of rigorous economic methodologies to the study of privacy risks and trade-offs, and has pioneered the application of behavioral economics to understand the hurdles individuals face in making privacy decisions. This work has been vastly influential among researchers, policymakers and industry. Bauer, Christin and Cranor received the IEEE Cybersecurity Award for Practice for their body of work on passwords over the past nine years. They looked at the question of how to make passwords easier for users, yet harder for attackers to guess. Their work sheds light on this by developing a robust methodology for studying password strength and usability, and then using that methodology to show how better password policies and helpful feedback to users (powered by deep learning) can make passwords both more convenient and more secure. Also earning awards as members of the CMU team were Ph.D. students, alumni and research staff Saranga Komanduri, Michelle Mazurek, William Melicher, Sean Segreti, Rich Shay and Blase Ur.